The Majestic palm prefers full sun and lots of water, The Majestic does well in wet conditions, and dislikes dry. 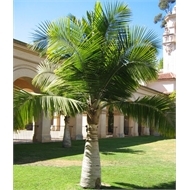 It has a feathered leaf, no crown shaft and is unarmed (no harmful spikes or spines). 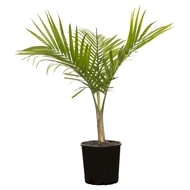 It is a magnificent palm but not fully frost tolerant, will grow in Victoria if it's protected from severe frosts.